Sairem can provide support to customers during the feasibility study before deciding to invest in new equipment and clarifying some of the doubts that could rise about the efficiency of microwave and radio-frequency technologies. Sairem advises on how to optimize the effects of electromagnetic radiation in different application conditions. Lastek is delighted to announce that we have been appointed exclusive distributors in Australia and New Zealand for SAIREM SAS, of Lyon, France. Sairem is among the international leaders specialized in microwave and RF laboratory and industrial equipment for food processing, science and medicine. The key differentiator of Sairem’s knowledge is the ability to develop applications that cover the entire spectrum of electromagnetic energy and to scale up standard or custom made processes from laboratory up to industrial at power levels starting from a few watts up to several hundred watts. 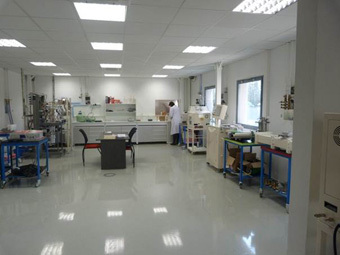 The group has outstanding reputation in international research and can provide complete technical and engineering support for designing and manufacturing the highest quality industrial solutions. At present, Sairem is the only microwave specialist that can design custom made components or engineering complete solutions, provide support for all aspects of customers’ go-to-market strategy, from prototype to production, select cost-effective components, test prototypes and assemblies, and manufacture the highest quality solutions. This surface wave type of plasma source generates plasma in a dielectric material tube placed in a standard Sairem WR340 waveguide. This plasma source enables the ignition and sustaining of long plasma columns depending on the pressure, the microwave power and the gas nature. The Downstream plasma source is ideal for working at pressures between 10-1mbar and a few tens of mbar with dielectric tubes diameters between 30 and 50 mm; it can equally work at atmospheric pressure. The Downstream plasma source could be used with an alumina tube but other low loss, high temperature resistant dielectric materials such as quartz, PyrexTM or boron nitride could be used. Inlet and outlet chimneys were designed to sustain and centre the dielectric tube. Moreover, in order to extend the operating conditions in the atmospheric pressure range and/or in the high power range, the dielectric tube can be air cooled and the downstream source can be water cooled. The Sairem Surfaguide is a waveguide-based electromagnetic-surface-wave launcher that allows sustaining long plasma columns using microwaves. The plasma is ignited and sustained in a dielectric tube that crosses a rectangular tapered WR340 waveguide. The reduction of the height of the WR340 waveguide allows to sustaining the plasma by increasing locally the microwave electric field, feature particularly important when working at atmospheric pressure and for external tube diameter that does not exceed 20 mm. The Surfaguide is ideal for working in the atmospheric pressure range with dielectric tubes diameters between 10 and 20 mm and could equally work in the mbar range and down to a few 10 -2 mbar. The Surfaguide could be used alumina tubes but other low loss, high temperature resistant dielectric materials could be used such as quartz, PyrexTM or boron nitride. Inlet and outlet chimneys are designed to sustain and centre the dielectric tube. Moreover, in order to extend the operating conditions in the atmospheric pressure range and in the high power range, the dielectric tube has an air cooling possibility and the Surfaguide, water cooling. This new head includes a water cooled magnetron and the filament transformer. An isolator with its reflected power crystal detector is connected to the microwave head. Quick release connectors for water cooling and high voltage are used on both the power supply and the microwave head. A water flow meter is connected at the exit of the cooling circuit of the isolator; this water sensor acts as an interlock which will completely shut down the microwave generator if not enough water flow is sensed. The Sairem sliding short circuit PCC MAN 130 PTV 2450 340 can be used in tuning applications for the adjustment of the resonance frequency of a monomode cavity; the sliding short circuit can be also used in connection with a hybrid T for the tuning of microwave applicators at high power. The tuner consists of a waveguide W340 with standard WR340 flange at one end and a short circuit (sliding cup) that can be moved inside the guide; there is a handle to help the movement of the sliding short circuit as well as a blocking screw to fix it in position once the tuning is achieved. The plunger allows quick adjustment while fine tuning can be achieved via a tuning screw. The position of the short circuit can be read on the visual (graduated in millimetres) display situated on the superior part of the waveguide. This display is made out of a transparent material that allows a good seal of the waveguide in order to protect its functionality & integrity (stops dust and other objects fall inside the waveguide) .The short circuit features SAIREM’s innovative /4 without contact.